2016 marks five years of me and the team traveling to every corner of New Jersey to deliver on our promise to give you the designer look for a fraction of the cost. Throughout this time, I have seen enough gray walls to last a lifetime! Don’t get me wrong – I have nothing against the color itself, but when I see the same gray with a bluish tone, it reminds me of the last house, and the house before that, and the house before that. Don’t we all want our homes to stand out above the rest without being too bold or quirky? Now, some of you might be saying, “There are grays with a hint of blue in them? I thought all grays were the same.” Not all grays, and therefore not all neutral colors, are created equal. I’ve seen grays that are downright institutional, and others that are nothing but classy. It all depends on what other pigments are added to give it just the right edge of elegance. Since painting the walls is the least expensive way to dramatically change the tone of any space, it’s critical that whatever palette you decide on, that the whole house flows within that palette. This is especially important for stagings so that potential buyers can more easily imagine themselves living there. If you assign the rooms an overly-specific style, it could limit the space in a way that prevents the buyers from seeing its full potential. 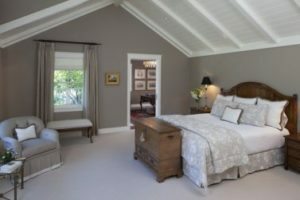 Rather than providing you with 50 shades of gray (LOL), here are 3 basics on the gray spectrum that instantly elevate these sample bedrooms. 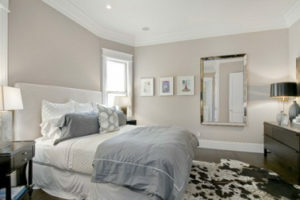 (Note: these rooms were not staged by us, but by other wonderful designers around the country.) Darker shades don’t necessarily make the room feel smaller (especially if there’s plenty of natural light), so don’t be afraid to paint a corner with one of these swatches and see how the light affects it throughout the day. If you need some tips and suggestions before renovating your next flip, call me for a consultation and I’d love to share more paint knowledge with you. I hope you enjoyed this blog post and look forward to reading my article next month. Until then, Happy Staging!